krismulkey.com: Cheap wine is très chic! Cheap wine is très chic! You heard it here first. Cheap wine is chic. I'm starting the trend. I'm on a quest to find decent wine that is less than ten bucks. And when I mean decent, I actually mean good wine. Wine that tastes good and doesn't give you a headache in the morning. We should all be able to enjoy the things we love without breaking the bank. So since I love wine, I'm going to find great wine that I can have with great home cooked meals. I know there are great, inexpensive wines out there. I just have to find them. So we can all be très chic! The key is finding wine that won't give me a headache. I had some cheap wine last Friday afternoon (Rex Goliath Pinot Grigio) that gave me the WORST headache Saturday morning. It really bummed me out and made me wonder why some wines give you a headache and some don't. And why is it usually the cheap wines? Some say it's the tannen. Some say you didn't drink enough water. I don't know. I'm no scientist. All I know is that on Saturday afternoon I decided to treat myself to a nice dinner. I was so relieved after talking to Don and Elli that I got my appetite back! We hung up the phone and I literally ran to the store to grab a bottle of (cheap) wine and buy something yummy for dinner. I went to BevMo for the wine because I knew I could get something good and cheap. I picked up two bottles. One bottle was a Rosé for $6.99 and the other a Malbec $5.99. Both wines are from Spain. Of course, these were the ClubBev prices at BevMo, they aren't always this price. After I hit BevMo I went to Bryan Foods in Corte Madera. They are my favorite place to buy fish. I love their halibut encrusted in citrus panko. It's expensive to buy for 3 people so we don't get it very often. But not bad when you're just shopping for one. Well, it was still nine bucks. But since I had popcorn for dinner the night before I felt like I could splurge. The halibut and wine were the perfect pair. The wine was delicious. It had strawberry scents, but tasted more like black cherry. It was sweet, but not too sweet. I really liked it. And the fish was fabulous as usual. 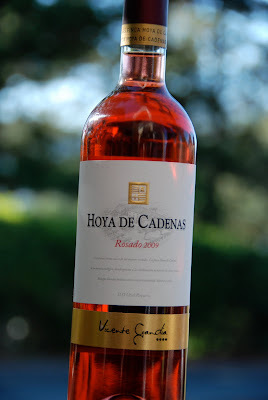 Hoya de Cadenas, Rosada 2009 - Wilfred gave it 90PTS. He describes it as "A bright and sassy Rosé with serious designs, the scintillating '09 Hoya de Cadenas Rose is resplendent with ripe strawberry and raspberry flavors; perky and crisp in the finish." And the next day? No headache. Bravo. I'm off to a good start!